Great rug! The beige is a little lighter than I had hoped but overall a great quality item. There is some shedding at first but this does improve with time. Bring a dash of coastal style to your hallway with this charming Jacques rug from Strick & Bolton. The rug is hand-tufted from wool into attractive design with a solid center with a complementary border. The indoor rug is rendered in a pleasant color that is sure to enhance the elegant style of your corridor. I had been looking for a solid area rug, which is hard to find, and had almost decided to have a piece of carpet bound, when I saw this. I like the slightly contrasting border. My rug is beige, and I took a chance on the shade but was happy that is was very true to the photo. 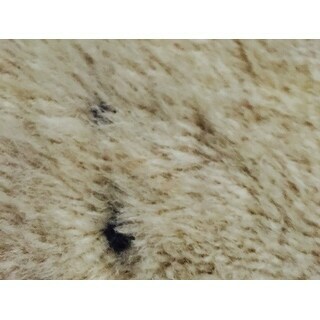 It is a pale camel shade. It does have streaks, or striations of a grayish tone throughout, but I think that will help to hide spots. For wool, the price is low, so I hope it wears well. The pile is low and the edges are overcast, not bound with tape. The rug arrived today - good things, 1. It didnt smell 2. Beige color was warm ivory versus taupe. 3. border was very subtile, which I liked 4. easily unrolled and was flat with no problem. 5. nice plush, dont think I need a rug pad. Cons - it has a few yarns that pulled, I snipped them off but wondering if its going to show. 2. Its not trackless but I dont know if any wool is. 3. on first Vaccume it was full but I guess that is expected. So I will keep it, but taking pictures of the loose yarns just in case. Overall - good value for a non toxic wool rug. Update - after owning it rug for a week, I am very happy with it. t does not show a lot of footprints either. Great rug, great value. This is a beautiful neutral rug with a thick luxurious pile. The price was very good and the quality and look of the rug exceeds my expectations for a rug at this price point. The color is very pretty. The center is a cream/ivory color and the border is a grayish tan. My one issue is the heavy shedding. I bought it for my baby’s nursery and he gets covered in wool hairs everytime he plays on it. I had read other reviews that mention the shedding, but I thought after a short while it woyld stop, but I have had it for months now and it STILL sheds like crazy. I am hoping that this is just the nature of wool rugs and that eventually it will stop?! If not for the relentless shedding I would have given it five stars. I ordered the green rug for dining area under dining table and it looks great and does not shed as much as other reviews have indicated; although that may be due to the fact it is not in heavy traffic area. The color and quality of rug is great and it has a nice finished backing so I did not feel the need to use a carpet pad underneath on our hardwood floors. It does shed upon vacuuming but I haven't noticed any clumping of fibers. Delivery was quick and the rug layed out flat with no curled up corners. Very pleased. I am overall very pleased with this rug. It does shed, but that is typical with most wool rugs. It's already shedding less after some vaccuming. The color is VERY light. I love the color, just not sure it will hold up my family room. The interior is a cream color...was hoping it was more beige. Quality appears very good. It's fairly soft for a wool rug. Worth the money for sure!!!! We have coastal style decor in blues and Love this cobalt blue rug! Quality was much better than expected. Would purchase another nuLoom rug in a different color when needed. This is a beautiful, quality rug. Just be warned, that like most solid wool rugs, it does shed for awhile. This rug is high quality, soft on the feet and color is true to the photos. It has been shedding but I expected that with a wool rug. Happy with my purchase. I have only had this rug for a week but so far it is a sure keeper. the color, the light cream, is just like in the picture. The pile is plush and tight, a real pleasure to walk on. It did shed a bit at first but that is generally expected with a wool rug. It is new so I can't comment on how it will wear. Color is very nice. It is a very muted beige; more on the taupe/gray spectrum than a cream/yellowish. Quality is good and hardly shed. Would like if the size was 7'10'' like other comparable rugs instead of 7'6''. beautiful and soft under feet. Very little shedding. Highly recommend. The grey rug has a very slight slate blue tone to it but not too much- gorgeous! This rug is soft and, in gray, a beautiful color. I wasn't in love with it at first bc the gray had a yellow tinge to it. But we've noticed (through a patch that has been covered) that it turned into a much more silver gray with time. Not wonderful if you change your furniture arrangement but a much better color! The big delta when we first received it was the shedding! It took about 6 months for that to abate. Now, we love the rug in every way. As many others have mentioned, this rug has shed since we've had it, but it sheds less now. My major issue with it is that apparently it has a black fiber backing and when some threads are lost, that shows through...looking like a black stain which it isn't. It's only two years old but I'm already looking to replace it. I liked the color, but I am very disappointed with the lack of quality. Love these rugs. Perfect neutral rug. Really not that uncomfortable to walk on. I have them in places where I'm not walking on them all the time. Love the look! Love this rug. Looks clean and elegant! Only setback is it does shed but that goes with having a wool rug. Great price! The pic that shows up for beige is what I ordered for, but I got the ivory one with a light grey border. Will be good if they can show the correct picture when you choose the color. And also it was shedding heavily - I could see ivory fibers all over the home. I returned it. Good bang for your buck, but it sheds like crazy. Nice quality rug, does shed like most wool rugs however. The tan shade wasn’t best choice for under a dining room table as the chairs left indents in the rug an made it look like a dark, dirty spot. Darker color probably would be better. Yes, I would recommend! Great colors! Thick, and comfy to the feet! 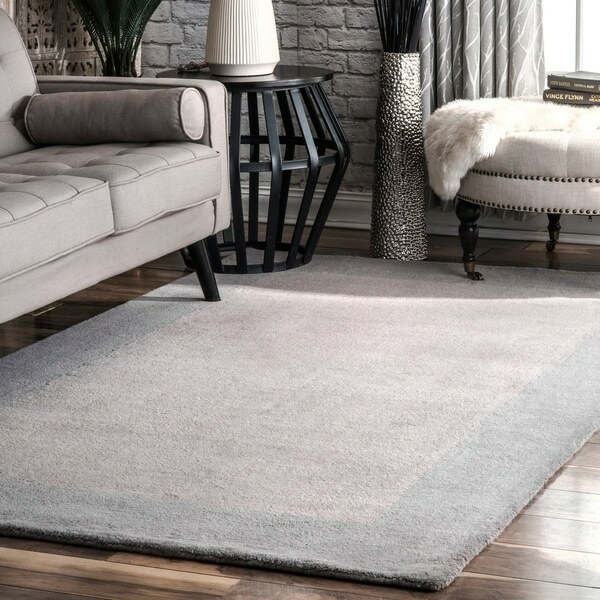 I got this rug for a bedroom, it's wool tightly woven so it doesn't shed much, yet it is soft underfoot and looks really good against the hardwood floor; the tone on tone make it a great neutral. I would buy it again if it got stained or damaged. Very happy with our purchase of this grey wool rug. Wool will shed quite a bit. But it’s also hypoallergenic and low in VOCs, so it was worth it to us. 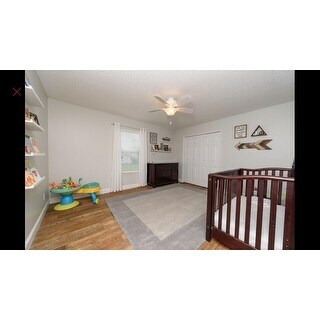 The grey color is a slightly blue-ish grey but looks perfect in our gender neutral nursery. I've had this rug for months now and I honestly don't care for the color or the rug. It looks like it's dirty and continues to shed fibers. Depending on where your natural light comes into the room, changes the color of the rug. The edges have frayed, and I'm just not pleased with this purchase. Option: 2'6" x 8' Runner - Grey | Beige - 7' 6" x 9' 6"
Originally was disappointed as the gray looks much lighter online than in person. However, we kept it and have been pleased overall with how it has held up in our child's nursery (nearly three years ago!). That said, it DOES shed a lot (though this tends to be the case with wool rugs in general) and it doesn't do well with spot treatments for stains (so don't be like me and make sure to spot test first). "I have been searching for a solid GREEN rug. Could you please describe the color to the best of your ability. he photo looks very light in color. I hope it is not more toward avacado!" Unfortunately I purchased this rug in grey so I can't help you out. I would say the rug is more light green with a fern green border. "I like the photo of the ivory rug with the light gray border. I read a review in which the customer states that they ordered the beige one and it was ivory with gray border. So which option from the drop down menu should I select when ordering? Beige? Or is the photo I like the Gray option?" The gray color option is the one to order- the second image in the color carousel, with the gray border. "Is the gray in this rug the same as the gray in the nuLOOM Handmade Abstract Fancy Border Wool Grey Runner Rug?" "How long does it get to take the shedding to stop ?" To date, my rug is still shedding. "I'm trying to order the grey rug, however it's not an opinion in the check out. Does this mean the grey is out of stock? " The fray rug is available under the Options drop down. "Is Beige out of stock? If so when can we expect it?" "What color is the beige? Is it closer to tan or ivory? are there yellow undertones?" The beige is more ivory than tan. Warm undertones.